The need for a Resource Centre to serve the under-resourced and heavily populated Hako area was identified at an historic Hako Women's Forum held at Lemanmanu Mission 25-26th June 2006, attended by over 750 women plus Late President Hon. Joseph Kabui and Late Administrator Mr. Peter Tsiamalili and many Hako Chiefs. Achieving the goal took a huge amount of effort and persistence over many years, from the Hako community and supporters overseas. Luman Hipakoko was designed pro bono by an Australian architect, Amber Guarde, by arrangement with our PiCCA partners in Brisbane. All the on site catering to the full building team over two months construction period was from our HWC women using the haus kuk. See photos of building the Haus kuk below. Original attempts to build had begun in March 2017 by laying the foundations with 20+ tractor loads of ‘karanas’ (coral gravel) hand dug from the gravel pit. 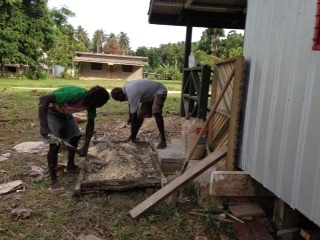 Progress was affected by stop / start legal preventive orders obtained by a small group who opposed the project. 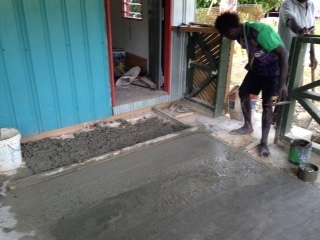 To allow the foundations to proceed for the Luman Hipakoko building, HWC received support from all the women’s groups of Haku, the local community who provided all the labour, the Village Clans and chiefs. 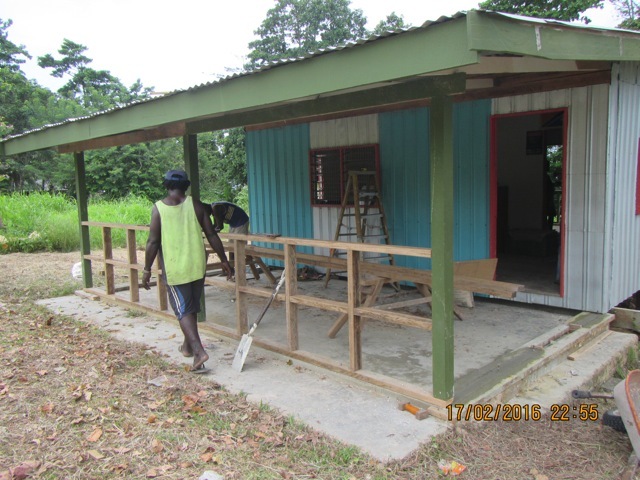 The Village landowner chiefs had to front up to the Village Court Magistrates 14 times to address claims for compensation from two men who challenged the community, the clan and the women to give HWC the right to build. 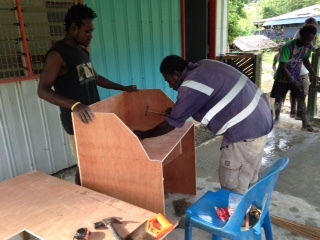 HWC quietly researched our rights with regard to ABG and PNG gender equity laws and how these might support our cause. Chiefs came out onto the road in droves and met in a significant Land Dispute Meeting to resolve the dispute. In the end the Village Court Magistrates imposed a PROTECTION order for the HWC and the building, and whole site including all overseas visitors. 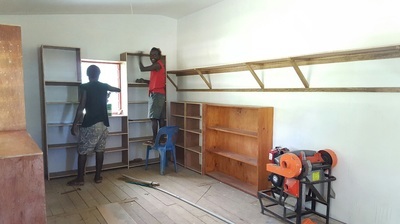 Late in 2015, HWC began construction of its first building: the Resource Centre, in a former tyre repair workshop in Ngalkobul village (see below). ​This conversion involved lifting the roof and lining ceiling and walls, extending front and back public access areas and altering doorways, windows and building steps and railings. Indoor fixtures included library shelving. 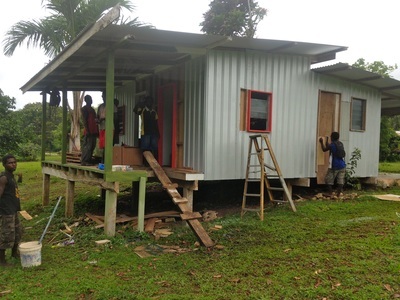 The Resource Centre, comprising a library, project office and a safe house, was formally opened in June 2016, around ten years after the first plans (see below). 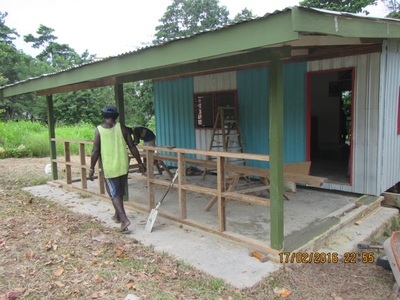 After the need was identified in 2006, ​HWC successfully negotiated with landowners to lease a site, and successfully applied for funding from the Bougainville Government. However, much of the allocated amount was diverted for use in the Bougainville elections and was not subsequently restored. For various reasons HWC could not obtain funding to proceed with building at that stage, and concentrated on delivering its programs using what resources it could find.